Sight Unseen is an incredibly inspiring online magazine with features on artists, designers, makers and thinkers far and wide. They have decided to bring their magic online to the printed page. 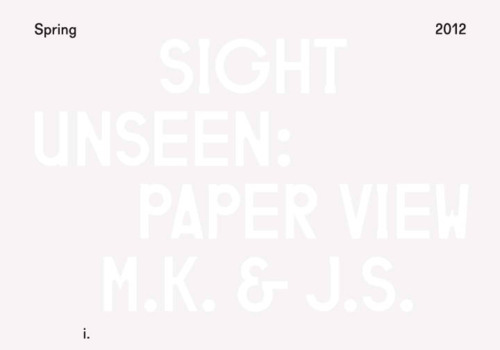 With the help of the Karlsson’s Vodka Unfiltered project and the design chops of Studio Lin, Sight Unseen has created a special printed edition called Paper View. Inside, you’ll find 21 brand-new features on Peter Shire, Anntian, Keegan McHargue, Shabd, Shin Okuda, Wary Meyers, Andy Rementer, Raven & Boar, Cmmnwlth, Sanntu Mustonen, Leutton Postle, Chen Chen and Kai Williams, New Friends, Jade Lai, Nacho Alegre, Patrick Parrish, Brian Janusiak and Elizabeth Beer, Felix Burrichter, Roanne Adams, Roman and Williams, and Sebastian Wrong. Plus, an essay by the editors about what two years of interviews have taught them about what it’s like to be a maker. Check it out on their site and if you’re in NY, they will be hosting a launch party with a pop up shop lasting from April 9 - May 6 at Creatures of Comfort/NY. Look for WAKA WAKA on the page and in the pop up as well. Yeah!